Sweet Briar is only 30 minutes away from the Appalachian Trail and Blue Ridge Parkway. Both of these long-distance routes provide access to hundreds of miles of trails leading to vistas, waterfalls, mountaintops, lush valleys and rushing creeks. Hiking Upward is one of our favorite resources for finding hikes in the mid-Atlantic. 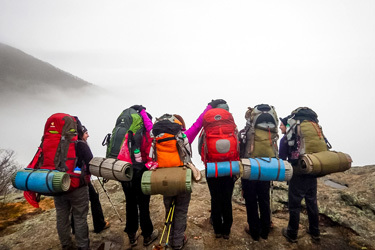 The following hikes are some of our favorites, and often one or two of them will be offered as a trip through the Sweet Briar Outdoor Program. The information for these hikes can be found on the Hiking Upward site linked above. Cole Mountain — Only 45 minutes from Sweet Briar, this short hike leads you to the top of a bald mountain with a 360-degree view of the Blue Ridge Mountains. Mount Pleasant — This hike takes you to the top of the mountain adjacent to Cole Mountain, offering 270-degree views of the Blue Ridge and of the meadow atop Cole. With multiple trails to the summit, you can make this a loop hike or an out-and-back, both of which are about 5 miles long. McAfee’s Knob — This 6-mile hike leads to one of the most photographed spots on the Appalachian Trail, a protruding rock that gives you an amazing 270-degree view of the Catawba Valley. This hike is one of the gems of the region. Peaks of Otter — There are multiple trails in the Peaks of Otter Recreation Area for different abilities and strengths. Choose which trail fits your fancy to reach the summits of Sharp Top and Flat Top mountains. Crabtree Falls — This 4-mile hike follows Crabtree Falls, the tallest waterfall east of the Mississippi, from the base to the top. The view from the top of the falls is worth the hike! Shenandoah National Park is another favorite of the Outdoor Program and is only an hour’s drive from campus. With more than 500 miles of trails in the park, there is something for everyone. Click here for trail maps and other important information.